Discussion in 'Conspiracy Theories' started by inkwell, Oct 4, 2017. Regular lurker for years. I saw a post on Reddit which details the contents of an allegedly destroyed AA77 Aircraft Accident Package, and wanted to get any insights on it's validity. Specifically, an explanation as to why the accident report doc lists the number of passengers and fatalities as "unknown". 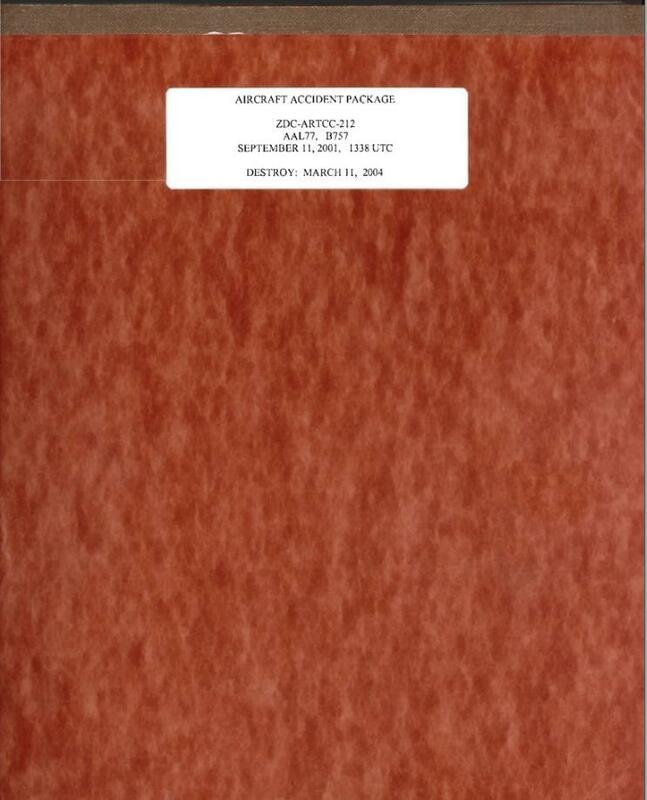 This document is the response I've encountered when conspiracy theorists are challenged with the fact 60+ people died on board AA77 when it slammed into The Pentagon. The conspiracy narrative is that The Pentagon was not attacked by a hijacked passenger plane. But rather a missile, or other aircraft besides AA77. I've searched for this accident package extensively, but seemingly can't find anything about it on the internet. Look forward to your insights. Specifically, an explanation as to why the accident report doc lists the number of passengers and fatalities as "unknown". Presumably because the person filling in this form did not know, likely because it was not relevant to the purpose of the form (FAA Form 8020.6). The ARTCC stuff is just about the air traffic control. Makes perfect sense as it was completed by Washington Air Traffic Control. Their primary purpose is the separation of airplane flights and the expedited sequencing of arrivals and departures. They likely wouldn't have the crew and passenger data. If it were American Airlines filling out this standard FAA form, it would be another story. The document mentions several times the provision of 'pertinent information' - which, in this particular case, for Reagan Air Traffic Control, would be weather conditions and operating staff at the time of the incident. Given that their report is dated three months after 9/11, requiring Reagan ATC to provide passenger details, etc would not be "pertinent". 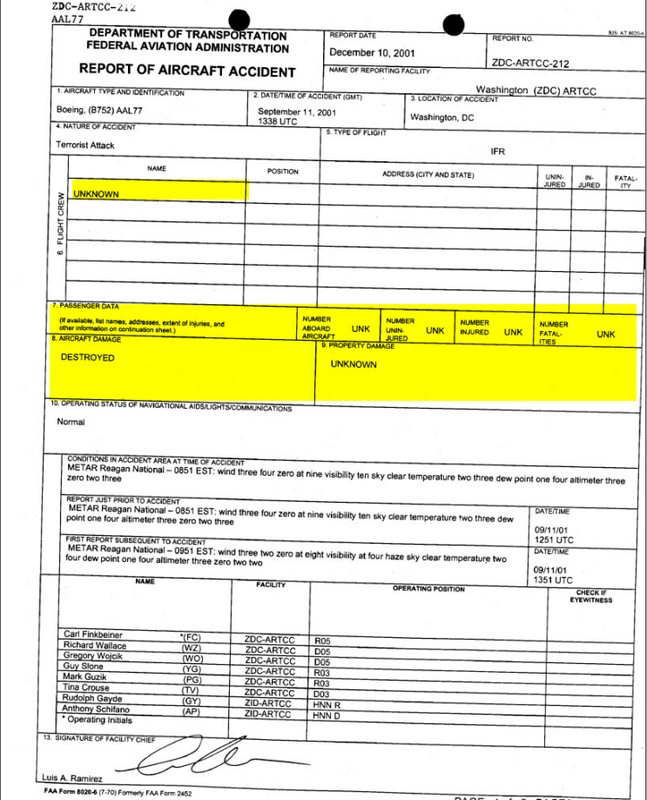 The form screenshotted in the OP is FAA Form 8020-6; in the instructions for submitting this form, on page 274, most detail is given to the provision of information regarding "weather data" and "air traffic personnel involved". Details regarding passengers and flight crew are not mandatory, as an instruction is given to not delay making the report due to not having this information. From what I can make out, any facility having an association with AA77 would have been required to submit one of these forms. Presumably, at least one of them, from a more directly involved organisation, would have already given details of the passengers and flight crew. Also, there should exist in the Accident File at least one copy of the more detailed Form 8020-6-1, which is for facilities which "worked with" or had "direct contact" with the aircraft. Whether this was the case for Reagan, I don't know. Probably the best line of inquiry for those who find the Regan 8020-6 suspicious is to consider the Accident File/Package as a whole.